Howdy, lettering and drawing nerds! I finished up 100 Days of Getting Started last week. This is the first completed project during my creative residency. Celebration is lovely in theory but most of us hardly make time to commemorate important milestones because we're too busy moving on to the next thing. Not this time! I decided to celebrate with a rousing night of illustration at Studium. Lucky for me, Justin David Cox had hosted a lettering night in the past and was looking to do another. 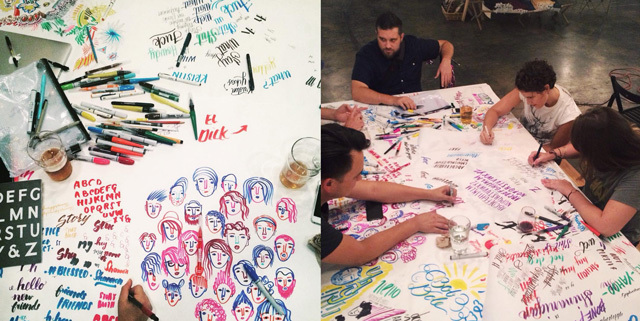 We combined forces and created a super party: Drawing/Lettering Night. It was a real hootenanny. We drew, lettered and drank. In case you missed it, fear not. We're going to have another in September. Stay tuned!